One of the most interesting (I think anyway) conversations with these new creators rights discussions began when Erik Larsen join in. Erik and Dave Sim were writing letters to each other concerning publishing rights ("The Right to Reprint"), the Neil Gaiman vs. Todd McFarlane feud, and The Creator’s Bill of Rights. These letters from Dave, Erik, and then Steve Bissette are far too lengthy for me to post on this forum, so I’ve decided to post the links to these letters below. A letter from Dave Sim 2: Erik Larsen and Dave Sim debate a creator’s right(? ).Erik and Dave’s first correspondence starts here with "The Right to Reprint" debate. Erik Larsen: "The whole Neil Gaiman situation I found to be particularly annoying, mostly because the characters Neil "created" were variations on Spawn himself. A female "angel" instead of a male "devil," medieval versions of existing characters, etc. It bothered me that Todd was stupid enough to let somebody "create" these characters and it bothered me that Neil would insist on owning something that he didn’t legitimately create." Dave Sim: "The Neil Gaiman situation isn’t as cut-and-dried as you’re making it out to be. Neil knew what he was getting into at DC. Sandman is their character and Neil, as a novice scripter, decided he was going to do some interesting things with it and see what happened. Well, what happened turned out to be huge and, from what I understand, DC did the noblesse oblige "right thing" and magnanimously granted Neil greater—and entirely unprecedented—participation in Sandman and other ‘considerations’ in acknowledgement of what had happened. Whatever he got—and, again, none of us knows because it all took place behind closed doors—all he could do was to count himself lucky because he didn’t have a legal leg to stand on and, presumably, he knew it." A letter from Erik Larsen: Erik addresses Dave Sim's letter concerning creator's rights and "The Right to Reprint". Erik Larsen: "The Neil Gaiman issue continues to be a sticking point for a lot of people. Neil got $100,000 to script a funnybook. That he’d feel shortchanged boggles my mind. Spawn was selling gangbuster before Neil wrote an issue—how much hid his name drive sales? How much did yours? As I recall, ALL of the guest-written issues sold about as well as each other. So—what was REALLY brought to the table there?" Dave Sim's letter to Erik Larsen: a letter from Dave Sim to Erik Larsen concerning creator's rights and publishing. Dave Sim: "Angela, I would maintain was a different matter entirely and I would think that all of these "well after the point of creation" items could be better handled on an issue-by-issue basis. It would seem to me that Neil was entitled to a royalty on each appearance of Angela and on the action figure and if that seemed unreasonable to Todd—and, as I’ve said, I can certainly see Todd thinking that $100,000 should be you some consideration—then the easy answer, it seems to me, is to write Angela out of the book and discontinue the action figure. And I quite agree with you on who was driving the Spawn bus. As far as I know the sales on Spawn 9 were probably higher than on Sandman to a factor of ten. Just as the sales of Spawn 10 were higher than on Cerebus to a factor of 100." A letter from Steve Bissette 4: Steve Bissette addressing Erik Larsen and Dave Sim's letters concerning creator's rights and publishing. I received this e-mail letter from Steve on August 9, 2005. Steve Bissette: "That Todd presumed he could retroactively, claim every conceptual property in the respective issue as his and his alone "boggles my mind," Erik. That you and so many others, including Dave, continue to make insinuations about Neil's character and integrity while defending Todd's "boggles my mind." Neil wasn't short-changed -- the deal, as it was represented to Neil, was broken as soon as characters and concepts Neil introduced in his work for Todd began to surface in other comics and media (of course, once Todd dragged Miracleman into the fray as some aspect of the proposed legal settlement, he only further complicated matters, using a character that was never his, that he never had any claim to or creatively contributed a damned thing to, as a bargaining chip). That was NOT the deal, apparently, was it?" Al's letter to Dave Sim 3: The following letter is one of many that I had written to Dave Sim addressing the continuing discussions of creator's rights. I've decided to post the entire letter. Al Nickerson: "I also enjoyed Steve Bissette’s latest letter (August 9, 2005, which is enclosed). Steve makes some excellent points. I agree with Steve’s statements concerning Neil Gaiman and his work on Spawn. I cant believe someone like Erik Larsen (who I do think is a nice enough fella) who works on his own creator-owned comic and works for a creator-friendly publisher can’t see that Neil, at the very least, should own the characters that he created for Spawn (there might be some gray area there concerning Medieval Spawn, but Angela and Cogliostro should belong to Neil). I’m just scratching my head on this one." A letter from Dave Sim 8: Dave addresses Steve Bissette’s previous letter, comments from the Comicon.com forum and The Pulse forum. Dave Sim: "If I were in Neil’s situation and I had created a character in Spawn that Todd went on to use in the film and the animated cartoon and as an action figure, I would hope that what I would say is "Okay, instead of getting paid $100,000 for writing a funnybook, I got—let’s say—$65,000 for writing a funnybook, $10,000 for the character being in the film, $10,000 for it being an animated cartoon and $15,000 for the action figure." You can move the amounts around from category to category whichever way you want, I think they still come out to excessively, mind-bogglingly generous. You know any other place on God’s green earth from 1938 on that would pay you $100,000—or even half that—to write a funnybook?" A letter from Erik Larsen 2: Erik Larsen addresses Dave Sim's letter concerning The Creator's Bill of Rights and the Neil Gaiman vs. Todd McFarlane feud. Erik Larsen: "The Creators’ Bill of Rights was always a puzzle to me. It seems as relevant to me as eight random human beings hanging out at a street corner getting together and making rules for mankind. It’s not as though anybody put them in charge of anything or have any reason to acknowledge or adhere to their rules. Those who drafted and signed it, talk about the Creators’ Bill of Rights as though it’s a document of some historic import, I’ll grant you, but outside of those who signed it—I’ve never had it brought up or even mentioned in passing to me by anybody in the industry. And really, I’m not sure why anybody should mention it. To call it a Creators Bill of Rights is a bit of a misnomer. It ISN'T a Creators Bill of Rights--it's the conditions under which these eight (or however many it was) individuals are willing to do business." Erik Larsen: "The McFarlane/Gaiman thing still burns me up in the basic unfairness of it all. As you said, "Had the judge asked them, I’m sure the all-female jury would have been happy to give Neil the rights to Spawn, Todd’s house and cars, Madonna’s uniform from A League of Their Own and the Mark McGuire baseball and anything else Neil expressed an interest in" and that’s not right. (Insert blanket condemnation of the American Judicial System here). Giving Neil Medieval Spawn is unfair. Had a jury let Todd own Medieval Sandman, Neil’s fans would be screaming bloody murder. Medieval Spawn is Spawn on a horse (and it was Todd who named him "Medieval Spawn," incidentally, when he made a toy based on his own design—Neil referred to his throughout his script as "Spawn."). To me, Angela is very much a derivative character as well. She could not have been created in a vacuum. She’s the opposite of Spawn. He’s from Hell—she’s from Heaven. He’s male—she’s female. He’s black—she’s white. She hunts Spawns, for cryin’ out loud! She’s the Spawn equivalent of Spider-Man’s Spider-Slayers. Todd eventually DID write Angela out of the book." A letter from Dave Sim 9: Dave Sim to Erik Larsen concerning creator's rights and publishing. Dave Sim: "Well, clearly no one is saluting the Bill of Rights as it stands nor do I really expect them to. It came about because I wanted to know where my rights ended and Diamond’s rights began when it came to selling books direct." Dave Sim: "I think a template contract is definitely more than worthwhile. It might take five years to put one together and once we put it together, yes, everyone will just ignore it. And then maybe fifteen years after that someone will say, "Hey what about that template contract that Dave Sim and Al Nickerson and Steve Bissette and Erik Larsen came up with?" And twenty years after that every editor, publisher and creator might very well have a copy of it in their top drawer and they have most of it memorized because it makes everything work better and far fewer people get seriously screwed when you use it than get seriously screwed when you don’t use it." Dave seems to assume that the amount of money involved resolves the ethical question. But the second part of that argument does not flow logically from the first. Dave seems to assume that the amount of money involved resolves the ethical question. I agree, and I've told Dave that. Dave believes that $100,000 is a whole lot of money for writing one comic book story. And he's right, that is a lot of money. However, I still believe that a creator's claim to his work should remain the same regardless of the amount of money he/she is paid for that work. I find the money issue Dave continues to assert completely beside the point -- it wasn't money PAID, it was Neil's SHARE of profits based on actual sales. As I detailed in my full letter, this is a key issue. Todd wasn't paying Neil out of pocket anything more or less than the sales of the issue earned. Any further claims seem completely suspect and awry, and the track record of Todd's payments to the collaborative creators of the issues relevent to that SPAWN arc (Dave Sim, the only sum on record since Dave generously donated it all to the CBLDF, Frank Miller, and Alan Moore) substantiate that the sum paid to Neil was a share of actual sales. Furthermore, Todd has not carried on in this manner with the others (Frank, Dave, Alan) as far as we know -- but then again, only Neil brought new characters to the table in the scope of his SPAWN scripts that proved of use to Todd. Dave and Erik carry on as if the money paid to Neil was a vast indulgence from Todd to Neil rather than an accurate share (royalty) based on actual sales. Dave and Erik argue that implicit in such a vast indulgence is the unwritten 'reality' (choke on that) that after being paid such a vast amount of money for such a pittance of work, Neil should just accept Todd's judgement and subsequent actions as justifiable and inoffensive, in effect an implicit and retroactive 'work for hire' agreement based solely on the vast amount of money paid by such a generous and benevolent Todd. Dave and Erik furthermore argue that Neil and anyone arguing Neil's position are so obviously and explicitly 'wrong' that the entire situation is unfair against the poor ol' Toddster and that Todd is somehow blameless. Which is, of course, absurd in the extreme. Dragging the whole 'public domain' rhetoric and gender (the references to an all-female jury) into the discussion is, at best, an obfuscation of the core issues. To me, it's clear the money paid to Neil carries NO IMPLICIT OR EXPLICIT RIGHTS SAVE THOSE CONTRACTED. Sans contract, TODD IS IN THE WRONG TO ASSUME ANY RIGHTS WHATSOEVER, SAVE FIRST PUBLISHING RIGHTS, period. If anyone anywhere has reason to rationally argue otherwise, I'd love to hear/read it. Dave and Erik convince me not at all. This is surprisingly inconsistent with the Dave I know and his public stand throughout the years regarding creator rights. I know Erik not at all, save his very gracious and kind phone call during the sometimes troubled '1963' months, and am sorry my outspoken views concerning the wretched treatment of Neil in these matters have most likely prejudiced Erik against me, but I shan't make that assumption per se. He chose to respond to my original letter Al posted on the Creator Bill of Rights site not at all, which in and of itself may be a response. I have to go with Steve and Al here; this is an issue of creator's rights, not one of unpaid or unfairly paid royalties or somesuch. For Neil, it appears to be an issue of principle--he created the character/s, wrote the issue in question himself (no script assists by Todd) and as such, he birthed them and feels as though the characters belong to him. I see nothing wrong with that, but perhaps my lack of experience with the comics industry first-hand limits my knowledge of such situations and how they are to be appropriately handled. My major gripe is Todd's continued uses of Miracleman "clones"...he does not feel comfortable enough with his legal stance to outright bring Mike Moran back, but he continues to use characters who are similar (at least in appearance) to said character. Personally, after flipping through Spawn #150 , I laughed out loud at this "Man of Miracles" Todd has brought out--it seems like a truly pitiful attempt to change the personalization of Mike Moran, from speech patterns all the way down to his hair style yet simulaneously bring the costume of MM back into continuity. Todd, just stop now. Stop the insanity--perhaps the best thing for you would be to be forced to return to (as you put it) "high school". For those who don't know about that statement, years ago in an article, Todd said he would not return to Spider-Man because he felt like it (paraphrasing) "would be going back to high school, and no one wants to go back to that once they are through". Perhaps if you were taken back to "high school" you would learn some humility, and remember that Spidey is the character that allowed you to be in your current position. True, if it was not Spider-Man, it would have most likely been another character with the same end result, but that matters not; the more important point is that you got where you are by the coattails of other folks characters and without them, Spawny-guy would most likely not be here. I just want to see the legal battle end, so that I can get a copy of the Olympus trade paperback, so I can stare at that lovely Totleben artwork without ruining my original copies. I concur Heath, but can that same logic be applied to Miracleman? If Neil Gaiman continues to claim ownership of Miracleman/Marvelman then ultimately the world will regard him as a hypocrite. Neil I know that you are very proactive on the net, so when you read this please make sure that you give me a decent response, I would like to think that you are a man of honour and that In the end you will do the right thing. If you want to take It off this forum then I will but I want you to think long and hard about what you are doing. Its not your creation Neil, It never was, If you were commissioned to work on a existing DC character like Superman, would you try to claim you owned that also? and please don't try to say its a derivative work, Its not, don't forget that Eclipse used the original 1950's artwork to reintroduce the character so that argument wont wash I'm afraid, In fact If that is going to be your stance then why don't you go and write a new middle 8 for John Lennon's "Imagine" and then try to claim some publishing money for your new section that you have created. See how far you get with the relevant music publishers. You seem like a decent guy but your actions aren't decent. As I have said I have no connection to comics and that I guess what helps me be objective regarding this shameful situation. Lets just see If anyone can prove me wrong. Gotta say, I'm pretty disappointed in Sim in this exchange. Larsen I expect to do a knee-jerk defence of his friend and business partner, and I don't expect any sort of sophisticated or nuanced view from, but Sim is way off the mark in ways you wouldn't expect. For all his other faults, Sim at least had a reputation as being ethical, in his own way, and here he is endorsing blatantly unethical behaviour (essentially saying it's okay to rip someone off if you paid them enough otherwise). On the notion that $100,000 is an unheard of sum for writing a comic book script, I think the generally accepted figure is that SPAWN was selling in excess of a million copies a month, maybe over two million, at the time. Let's say a million five (if anyone has more accurate figures chime in). At a $2 cover price, that makes the gross $3 million, or $100,000 a royalty of just 3.33%. Hardly generous, hardly excessive, I'm sure at the time a lot of people made over $100,000 for writing a comic. According to Sim's own Fables contract, DC pays the writer and artist each 4% of cover price for sales in that range (over 250K). Gaiman should roll over any play dead on his rights because McFarlane gave him a lower royalty rate than even DC does? Erik Larsen: "Gaiman has never done a book for Image. Neil worked for an Image creator on his book but he never did a book at Image so there's no arguing that "Image" screwed Neil no matter how you might like to twist things around. Moore did one book--1963 and "Image" didn't "drive him back to DC" at all--the reason Moore ended up at DC again is because Wildstorm was bought by DC and Alan was doing some books for Wildstorm. At best this is a misstatement of the facts." Erik Larsen: "Neil worked for Todd--not Image. The check he received came from Todd--not Image. His deal was with Todd--not Image. The characters he "co-created" were based on Todd's characters and were designed by Todd. The implication that somehow "Image wronged Neil" is a false one. It is a misrepresentation of the facts. "DC, for example, treated Gaiman a whole lot better than 'Image' did." is a misrepresentation of the facts. It's untrue because Image never dealt with Neil in any respect--Todd did." Did Todd McFarlane design/create Angela and Medieval Spawn? If so, that sorta changes this issue for me. I was always under the impression that Neil Gaiman created these characters. Steve Bissette is co-writing a companion book on writer Neil Gaiman. Steve asked me to search for material on the Neil Gaiman versus Todd McFarlane lawsuit. Specifically, Steve was looking for the court’s verdict on the case. I found the court’s decision here. I also came across this interesting article on the Gaiman versus McFarlane battle over the rights to Mircleman titled "WHATEVER HAPPENED TO MIRACLEMAN?". The book will be out this November, PRINCE OF STORIES: THE MANY WORLDS OF NEIL GAIMAN, and will feature the most definitive assessment of the Marvelman/Miracleman and Gaiman/McFarlane issues in print to date. Suffice to say, the investigation and writing of both chapters only confirmed for me the completely indefensible stance and actions of McFarlane over the years regarding both -- and that Neil and Marc Buckingham really did the best they could (and the best anyone possibly could have done) regarding Miracleman, given the circumstances. Any idiot mischaracterizing Neil as in any way trying to claim Marvelman/Miracleman as his own property should be summarily understood to be misinformed. Being passed the virtual torch from a long line of collaborative creators on that property who were (a) misled/misinformed about the rights of the property, (b) passive about any meaningful investigation of those rights and (c) equally passive about asserting their own (with one notable exception), Neil and Marc found themselves after Eclipse's bankruptcy carrying a considerable legal burden. Simply being last in line due to historical circumstance (had Eclipse not gone under, there's no telling how this may have played out), and in fact caring about the ethics and legal issues and trying to do the best for all directly involved (e.g., those who actually creatively contributed to the Marvelman/Miracleman property since 1982), isn't a crime, nor is it deserving of scorn or online verbal diarrhea. Neil and Marc have thus far done the best they can, and contributed considerable time, energy, work and money to trying to resolve the situation -- for the good of all concerned. It's not their fault that the legal chain of ownership prior to their involvement was/is so questionable and convoluted, nor that McFarlane has behaved so abominably and continues to behave as he does. McFarlane's assertion of himself into that lineage of folks claiming proprietary rights, sans substantiation (based upon the legal documents Al found online, and the final decision of the appeals judges regarding McFarlane's appeal of the verdict in the case of Gaiman vs. McFarlane, it's still highly questionable what, if anything, McFarlane truly does own here), stands tall among the various abuses of fellow creators by creators in the 1990s -- shame on Todd. And shame on his apologists, including Erik and Dave. Quote from: "Stephen R Bissette "
Even though, the fight over Angela and Medieval Spawn was a bloody mess, it seems like a small problem compared to the Marvelman/Miracleman debacle. It doesn’t seem (to me, anyway) like the Gaiman/McFarlane dispute over Marvelman/Miracleman will ever be resolved. Not fully, anyway. There appears to be even more folks involved in the ownership of the property than I first thought. I wasn’t too surprised by Erik Larsen defending Todd McFarlane. They seem to be buddies, they both co-founded the same company. Now, Dave’s opinion (that either says or even implies) that a very large amount of money automatically purchases your work seems mind-blowing to me… especially from a guy that, for years, has been such a outspoken advocate of Creator’s Rights. I don't get it. Well, as you'll see in November in the book, there's a whole new entity involved with the MARVELMAN/MIRACLEMAN debacle, so who knows... all I know is my amigos still don't see a nickle for their innovative work on one of the key comics of the 1980s, in part due to McFarlane, and that's indefensible. 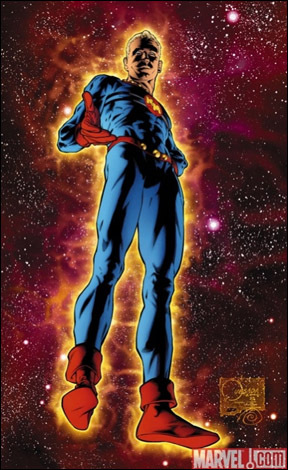 Things have just heated up with "Marvel’s Marvelman...?". Neil Gaiman blogs about his problems with Todd McFarlane concerning money-owed and created characters.